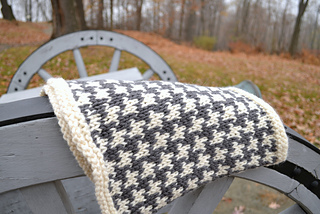 The Cowl of the Baskervilles is perfect for staying cozy, whether it’s during a New England December or when out wandering the moors and solving mysteries. The oversized cowl knits up super-fast with bulky yarn and would look great on men or women in almost any color combination. The faux seams running down the sides add a touch of interest, the colorwork is striking in the larger yarn and simple to knit (and memorize), and the double layer of wooly goodness adds extra warmth. 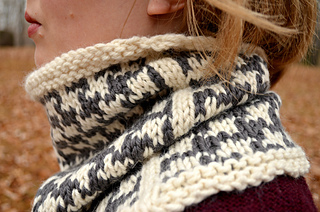 The ease of the colorwork and the knit in the round construction would make this a great introduction to colorwork. The Cowl of the Baskervilles is just right for this time of year — whether you need a quick knit to give, or a warm treat for yourself. Enjoy!